PHOENIX – Today, Robert Graham, candidate for Chairman of the Arizona Republican Party, released a video thanking Arizona’s Conservative grassroots for their efforts in defeating Proposition 204 and 121. The video highlights the tireless efforts of canvassers, callers, and volunteers in spreading the message that Proposition 204 and 121 were wrong for Arizona. To watch the video, click on the link here, or watch the embedded video below. AFP-Arizona Needs YOU to help us defeat Proposition 204! While current polling shows that Arizona voters are prepared to reject the Prop 204 tax hike on Tuesday, we must keep the heat turned up in the last days before the election. The facts on Proposition 204 are simple: It makes the temporary sales tax increase PERMANENT, which would cost Arizona taxpayers an additional $1 billion per year and potentially cost the state 15,000 jobs. Arizona families are already hurting in a bad economy, and this is worst time to raise taxes and harm economic growth. Prop 204 also provides an already bloated education bureaucracy — Arizona’s total education spending has increased over 60% in the last decade, even as a smaller percentage of funds has gone to the classroom — with even more money, while failing to provide real reform to Arizona’s education system. • Take whatever NO on 204 yard signs you may have to your nearest polling location on Monday night (Nov 5). • Take any extra NO on 204 yard signs you may have to key polling locations (use the email below to ask Bill where your closest key locations are). • Hand out anti-204 literature at your nearest polling place on Tuesday (use the email below to ask Bill for a printable version of AFP-AZ’s anti-204 talking points). • Per Arizona law, no materials (yard signs, literature, etc.) may be distributed or placed within 75 feet of polling locations. Please contact Bill Fathauer AS SOON AS POSSIBLE at 480-332-0477 orbfathauer@afphq.org to volunteer for these actions. (If you contact Bill today, or over the weekend, you will help us reduce our workload on Monday and Tuesday.) Even if you can only volunteer for an hour or two, your help will be vital in stopping a massive tax hike that will damage the Arizona economy. Thank you and keep up the good fight! AFP-Arizona is independently asking its activists to take these actions to oppose Proposition 204. AFP-Arizona is not a sponsor of the No on 204 campaign, nor is it acting in coordination with the No New Taxes, No on 204 ballot committee. PHOENIX — No New Taxes, No on 204 today released its newest television advertisement titled, “5 Reasons.” Business and community leaders across the state all agree that the $1 billion permanent sales tax burden that Prop 204 will place on hardworking families and small business owners is bad public policy. Although there are 100 things wrong with the initiative, the top five reasons are highlighted in this 30 second spot. To learn more about Proposition 204, please visit www.VoteNoOn204.com. The No New Taxes, No on 204 campaign committee released the following new ad this morning. The ad takes 30 seconds to describe five reasons why Arizona voters should vote NO on the proposition. One of the most outlandish aspects of the Proposition 204 power grab is the permanent increase in the state sales tax rate. It is a poison pill that should sink the initiative on Election Day. No tax rate should be permanent. Elected officials should always have the authority to set tax rates to meet changing economic conditions and the will of the taxpayers. The one-cent increase would give Arizona the second highest sales tax in the nation, a sure fire way to gouge family budgets and hurt every business in the state. The regressive sales tax hits low and medium income the hardest. It makes everything consumers buy more expensive. The Proposition 204 sales tax increase is a shameless exploitation of the genuine financial crisis in 2010 during the darkest days of the recession when state tax revenue went way down. Both taxpayers and lawmakers rallied to increase the sales tax rate by one cent to fund education and other essential services. Everyone understood that the sales tax increase was temporary. It is set to expire next year. Proposition 204 supporters want to exploit the 2010 crisis, make the tax hike permanent, and take tax policy out of the hands of state lawmakers. No wonder every business group in the state opposes Proposition 204. Every taxpayer should oppose it too. It is bad tax policy that should be rejected on November 6. 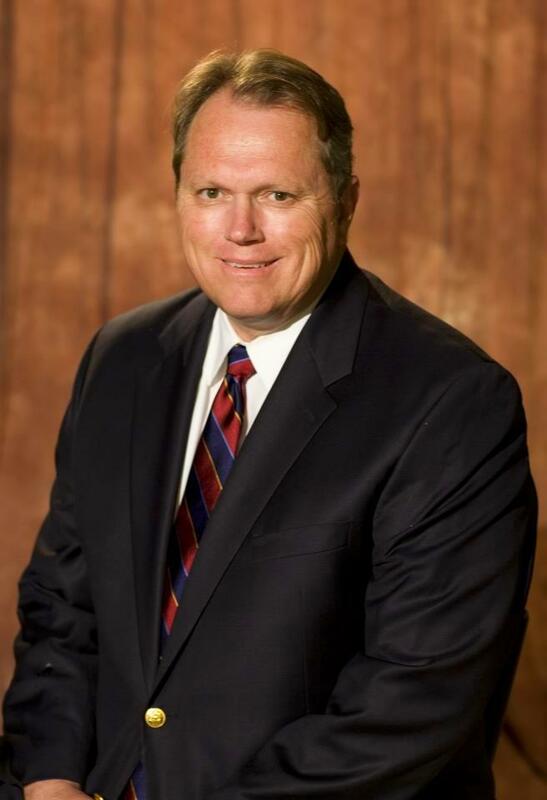 Follow Graydon Holt’s columns at Western Free Press. Over a year ago, proponents of Prop 204 thought that their special interest funded ballot initiative would pass without protest. Now, as the campaign heads into its final week, Prop 204, the $1 Billion dollar permanent tax increase, is more unpopular than ever. Proponents of Prop 204 thought their taxpayer giveaway would go unchallenged, but because of you, polls are showing that Arizonans are not interested in an initiative that does not promise real reform, accountability, or oversight. The message that Prop 204 is bad for Arizona families and business is spreading throughout the state. We are grateful for the momentum that has been created by community activists, elected officials, and business leaders who have publicly opposed and continue to fight this horribly misguided ballot initiative. Please join US Senator Jon Kyl, Arizona Governor Jan Brewer, and over 45-mayors and city councilmembers from across the state by voting NO on Prop 204 on November 6. We need your help! 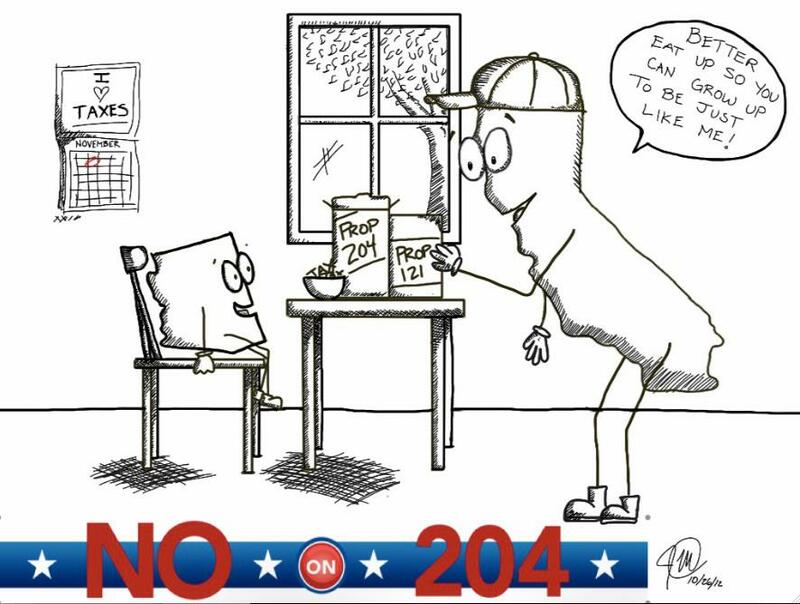 Please, take your No on Prop 204 yard sign and place it at your polling location the night before the election or the morning of the election. Lastly, let your family, neighbors, and coworkers know about how Prop 204 actually does very little for education, but fills the pockets of politically connected special interests. We need to finish strong; we need to defeat Prop 204 and send the message that we want real education reform. Thank you for your continued support! Education has always been a major part of my life. My father, Dr. George N. Smith, was a highly respected teacher and school superintendent here in Arizona for over 35 years. As the superintendent of one of the largest school districts, my father lived education – at the dinner table, at church, even at the grocery store. During his tenure, Mesa’s schools were considered to be among the finest in the nation. I grew up knowing that quality education was the key to success. That’s why, even as a struggling family, my wife and I made sacrifices so that I could go to law school. That’s also why education has been a key part of my HEAT (Healthcare, Education, Aerospace, Tourism/Technology) initiative in Mesa. So far, we have had a great deal of success with this initiative. We’ve increased opportunities in higher education by bringing five new colleges to our downtown. We’ve built stronger relationships with ASU Polytechnic, MCC, AT Still and others. We’ve teamed up with Mesa Public Schools to develop a plan to turn underused space into youth sports facilities with the passage of Mesa’s Question 1. I am also pleased to be part of the Mayor’s Roundtable on Education. I wholeheartedly believe that educating our children is the most important investment we can make in Arizona, and we should expect nothing short of excellence in our educational system. I have seen firsthand how critical quality education is to creating economic opportunities. I have long supported efforts to provide adequate funding for our schools and colleges, expand parental choice, encourage innovation, improve teacher training, and demand accountability. During this recession, many Arizonans have expressed their displeasure with the manner in which State leaders have handled educational funding priorities. Prop 204 is a product built from this frustration. Unfortunately, it is a flawed product; and, is bad public policy. Prop 204 imposes a permanent fix for what is most likely a short-term problem. All too often, these inflexible changes become outdated as the world changes. Rather than curing the actual ailment, these solutions end up merely easing the pain for a short time. They then often prohibit substantive reforms that would have a more lasting impact. Prop 204 may even reward the status quo, which will also inhibit real changes in school financing or performance. This will not inspire the kind of transformational reforms that our children need and deserve. In its attempt to solve one problem, Prop 204 will also simply shift financial challenges from one area of government to another. And, the changes in Prop 204 will make it more difficult, if not impossible to achieve much needed overall state tax reform. Arizonans should demand real solutions from our leaders to the challenges we face. Prop 204 not only fails to solve these challenges, it will keep us from making the changes we need to improve our educational system. Please join me in voting No on Prop 204. Let’s then work together to make Arizona’s schools the best in America! Don’t make us like California! 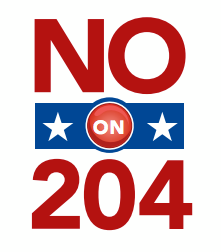 Vote NO on 204! Watch as Arizona State Treasurer details why Arizona voters should vote NO on Proposition 204 – the $1 BILLION permanent sales tax increase that funds special interest and more big government. You have to hand it to the construction industry companies in Arizona that builds roads and public transit. They found a clever way to grab millions in taxpayer money every year without answering to the state legislators elected to spend public funds. Proposition 204 is their route to riches. The Proposition would raise at least $1 billion a year by installing a one-cent permanent increase in the state sales tax rate. About $100 million a year would go to the construction industry. The proposition supporters claim that funds for education are somehow linked to jobs, meaning construction jobs. This is a stretch beyond recognition. Voters all over Arizona must be scratching their heads and asking what in the world roads and light rail have to do with improving student performance in the classroom.The answer, of course, is nothing. Proposition 204 supporters say only that their tax and spend scheme will help the state economy. Well-built and maintained roads and transit certainly help Arizona’s economy. But they should not be linked to education spending. The construction industry got this sweetheart deal by pledging to help pay for the Proposition 204 campaign. A $100 million a year subsidy paid by taxpayers is a good deal in exchange for a campaign contribution. Voters should cancel the deal and vote no on Proposition 204.